First up, “Food Network Star” Season 8 finalist Philip “Ippy” Aiona premiers his new dining option in the Food Court. Aiona grew up in the restaurant business, learning from New York-Italian and Hawaiian parents, and is presently executive chef of the family’s Italian eatery and coffee bar, Solimene’s in Waimea. 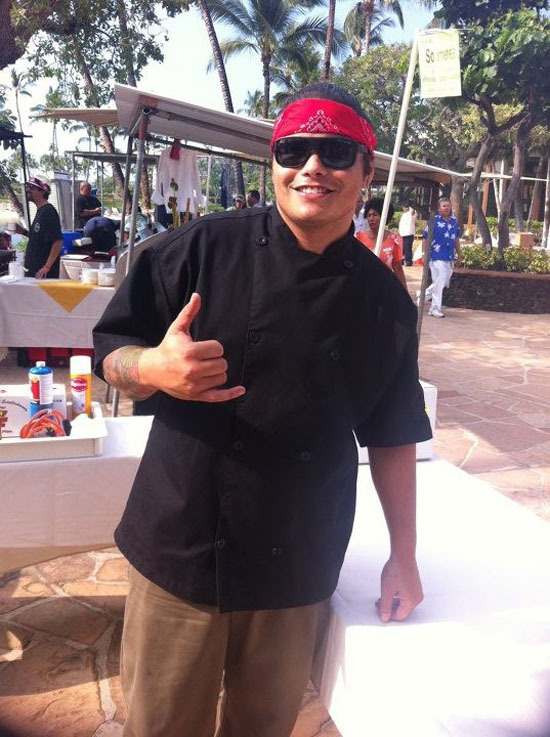 He attended California Culinary Academy and Le Cordon Bleu in San Francisco, and refined sophisticated culinary techniques with mellow island style to help win a spot on Chef Giada De Laurentiis’ team on the Food Network competition. Easy going and popular on the show, Aiona’s excellence in the kitchen, combined with a winning personality, won acclaim through the gamut of challenges to Season 8’s last episode before its grand finale. Next, in mid December, Chef “TK” Thepthikone Keosavang opens Lemongrass Express — sister restaurant to his popular Lemongrass Bistro in Kona, in an abbreviated version for the Food Court. With focus on quality fresh food (locally sourced whenever possible), Chef TK says Lemongrass Express will feature excellent value with inexpensive lunch and dinner specials and return-customer incentives. Chef TK’s award-winning style comes from a long career with some of the best restaurants in the business, including 13 years with the MGM Grand Hotel, where he helped win “Best Japanese Restaurant in Las Vegas” two years in a row for Shibuya. Most recently Chef de Cuisine of the AAA Four-Diamond Brown’s Beach House at The Fairmont Orchid, Hawaii, Chef TK brings worlds of experience to Lemongrass Express, blending French and Asian techniques into his “nouvelle Asian fusion” cuisine. For more information, visit www.lemongrasskona.com. Nearby, Sansei Seafood, Steak & Sushi Bar announces the appointment of Executive Chef Paul Goodwin to their award-winning team. A solid professional, Goodwin brings broad knowledge and experience from working with some of Hawaii’s top chefs into the kitchen at Sansei. Originally from Oregon, his culinary career has included Merriman’s two Hawaii Island locations, Wolfgang Puck’s Spago at Four Seasons Wailea, Roy’s in Kihei, Waikoloa and San Diego, and most recently D.K. Kodama’s Sansei Seafood Restaurant in Kihei. While he works with the staff to maintain and improve high service standards and food excellence, Chef Paul assures loyal customers that their longstanding kamaaina, early bird and late night specials will not change. Specializing in New Wave Sushi and Contemporary Japanese Specialties, Sansei has won recognition from Honolulu Magazine, the Honolulu Advertiser, Wine Spectator magazine and the Gayot website. For more information, visit www.sanseihawaii.com or call 886-6286.